TechPro Security Products is the premier company for Landscape Lighting South Florida. Our specialty is focused on residential and commercial outdoor lighting. We deliver the preeminent outdoor landscape lighting installation and design services in South Florida. TechPro Security Products landscape lighting designers will become your artists and turn your property from a blank canvas to a brilliant lit artwork. The main purpose of landscape lighting is to place an emphasis on the natural beauty of your plants, trees and surrounding foliage while directing a large emphasis on the architectural features of your home or business. TechPro landscape lighting design experts are ready to let you see outdoor landscape lighting can transform and broaden your environment all the while beautifying your home or business. TechPro Security Products main goal is to provide exemplary customer service to each and every one of Landscape Lighting South Florida customers. TechPro Security Products created their landscape lighting division mainly out of demand from many customers and their complaints about finding a professional landscape lighting company that offered the quality products and service we bring to the table. Featuring superior products with excellent landscape lighting designers and installation experts has led to much commendations and recommendations. Our main objective is to constantly strive for perfection while exceeding your expectations. Garnering your praise is what motivates each and every landscape lighting project we create for our customers. We will not be happy until you are completely satisfied with your outdoor landscape lighting. 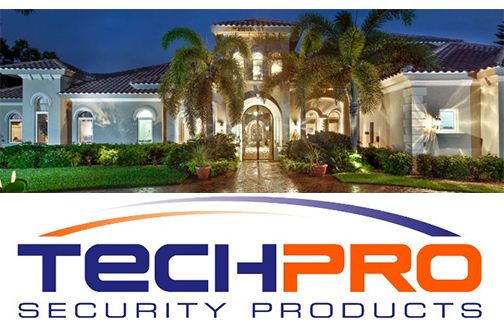 What makes TechPro Security Products the go to Landscape Lighting South Florida company? We’ve been in the installation business since 2007, located in the heart of Boca Raton. We carry liability insurance and are a Bonded and Insured installation company. We are a private business, not a franchise that pushes only certain brands. We are not restricted to proprietary landscape lighting brands or products. TechPro Security Products is easily the best alternative for an expert company that delivers the utmost service and quality outdoor landscape lighting. When your home or business needs landscape lighting design and installation, we have your best interest in mind. In a short time period, we have established a large customer base within distinguished communities and private homeowners. We provide service throughout the process from the beginning to the end we are there for you and your home. We fully respect and understand the private nature of your home. Florida is known for its lush tropical foliage and sunshine. Don’t let the most charming aspects of your home disappear every nite. Landscape Lighting South Florida will set the ambiance and highlight your property and architecture with brilliantly lit tones. Remember next time you pass a home or business that shines like the brightest star – a supernova landscape lighting display can be designed by our expert landscape lighting professionals. You do not have to break the bank to light make your home look like millions. LED Lights have come way down in price and cost much less than traditional halogen lights when used for landscape lighting. Let our Landscape Lighting South Florida experts plan the perfect lighting scheme for your home or business. Our obsession with each landscape lighting project is to make your home stand out and showcase your exterior architecture and landscaping. Let our highly trained landscape lighting experts take the worry out of installing and designing your lighting project. Landscape Lighting for Pool Areas, Landscape Lighting for Driveways, Landscape Lighting for Flower Beds, Landscape Lighting for Gardens, Landscape Lighting for Docks, Landscape Lighting for Screen Enclosures, Landscape Lighting for Entry Gates, Landscape Lighting for Walkways, Landscape Lighting for Ponds, Landscape Lighting for Waterfalls, Landscape Lighting for Decks, Landscape Lighting for Paths, Landscape Lighting for Trees, Landscape Lighting for Walls, Landscape Lighting for Sea Walls, Spotlights & More. Breathtaking landscape lighting is only a phone call away.